Saltwater is a byproduct of oil and gas production that must be disposed of. Each state has its own regulatory agency that describes how this process must be accomplished. In Texas, the state requires a form (P-18) that documents total amounts and the originating well of gathered water. Typically, this is a labor-intensive data collection process that may take weeks of processing to fill out the monthly report. 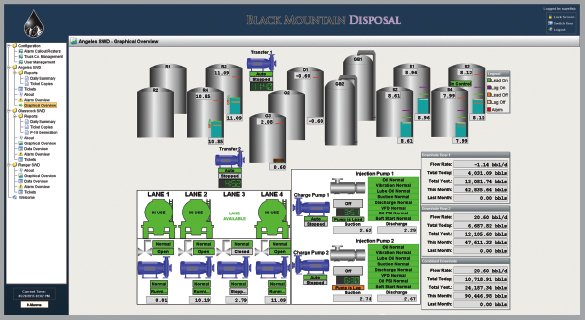 Ashley Automation used Ignition as a platform along with proprietary report software to automatically collect and generate the monthly reports. Ashley utilized the Ignition platform to facilitate everything from the local HMI, data transfer to a remote facility, data aggregation at the remote facility, and display of the information to the customer. There is an on-site panel PC running a single-client version of Ignition that is responsible for interacting with both the site operator as well as truck drivers. It communicates via MODBUS TCP to a local PLC to monitor site status for the local operation of the machinery. The driver screens collect load information from the drivers and then print a ticket (receipt) and store the information in a local database where the information is then forwarded to the remote data aggregation server. The system utilizes a Hub and Spoke architecture with the data aggregation server representing the hub and each remote site representing a spoke. Each remote facility has a single-client Ignition system installed on a Panel PC with around 275 tags used for communicating with the facility hardware. Communications to the PLC are wired MODBUS TCP and are contained within the same panel enclosure. From there, communication to the remote server occurs through the Ignition pipeline, utilizing a cellular data connection. The remote data aggregation system runs on a pair of Microsoft Azure machines. The first is a virtual machine running Windows Server 2012 and an unlimited client Ignition system. This machine is also connected to a second machine running Azure’s SQL Database service. Data is collected by the Ignition pipeline from each remote site and consists of the same roughly 275 tags per site. Information gathered is then served up to the customer via a desktop implementation of the Ignition client as well as a mobile version. Report generation on the gathered tickets is handled utilizing both Ignition’s Reporting Module as well as a propriety report software developed by Ashley Automation. 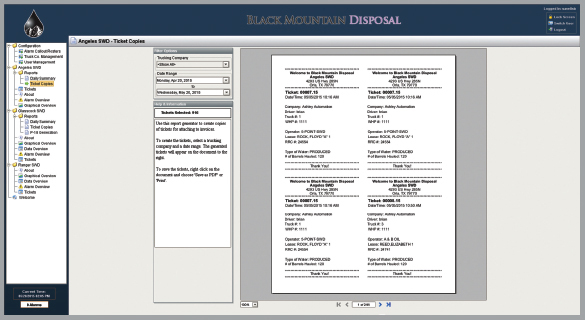 Ignition is used to provide daily summary reports while Ashley’s system is used to generate the state-required P-18 form. Ignition handles the P-18 generation external to Ignition gracefully by collecting the required inputted information from the user, submitting it to the SQL server (which returns a key to the report data), and opening the Ashley Report software using a system call along with the key as a parameter. The Ashley report software then connects to the SQL server, gathers the data, generates the report, then uploads the generated PDF report to the cloud (along with a reference in SQL to the link), which is then automatically detected by Ignition and displayed to the user. There are many moving parts in our system and Ignition handles them with ease. Ignition has been a great platform to build off of and has opened many doors that we simply could not open before – especially in the areas of rapid development and implementation. We’ve not only created a solution for our customer that fulfills their need, but have developed a complete product at the same time. It is our hope to take this Ignition-powered system and package it up to sell as a product to more of our current and future customers. Ignition allowed for easy PDF reporting. Ashley utilized the Ignition platform to facilitate everything from the local site to the remote sites. 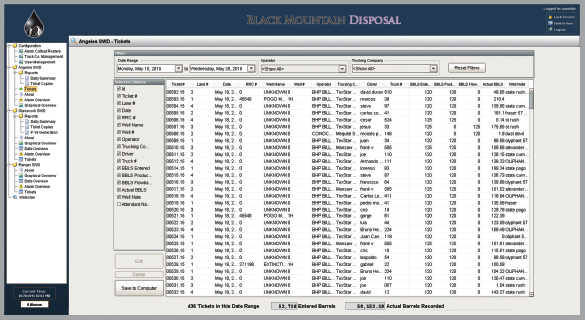 Keeping track of tickets from multiple, remote disposal sites.